This is gonna get hot, one of the best games of 2012! Have some well deserved heat! Price check at Grainger games, £8.99! Will PcWorld / Currys price match? Got it down to £8.52 through Flubit! Don't fully understand, but great stuff. Do you get the sniper missions with this? I always forget to try flubit! Not now you won't since it was only a pre order bonus if you bought Absolution. 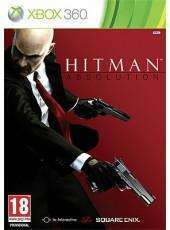 You can get the Sniper Challenge if you buy the Hitman HD Trilogy. I think this is a great deal. I thought this was one of the best games of last year. HOT! following on from the excellent Blood Money, I recently started this and I'm so disappointed. The ruleset is so inconsistent and it doesn't know when it wants to be realistic, and when it wants to be absurd. Enter a cordoned crime scene dressed as a henchman and people will be suspicious. Ok, thats fine, thats realistic. But in said crime scene there is a french maid feather dusting.... hmmm. If she spots you she'll leg it off and grass, even though if we're following realism then surely she shouldn't be in there either so why would she put herself in trouble? Despite the building swarming with identical henchmen whom she wouldn't bat an eyelid to, she'll still leg it if she sees you. Get past the maid unnoticed and you'll discover a fire alarm. "Great! A fire alarm! ", you'll think, "I'll pull this alarm and the building will be evacuated".... but no, the game re-writes the logic of fire alarms and just has a few henchmen move a bit closer to where you're stood. Its just too difficult to predict. A game as trial-and-error as this requires an option for the player to manually save at every little moment... but there is no such option so its reload-fail-reload-fail over and over. So it disappoints on too many fronts to even justify a tenner. Or just get Blood Money. This is the best game I've played in quite a while, just finished it this week. Free on next months ps+ for anyone that has it? What is Flubit? really interesting website but dont fully understand it. I have no idea how their business model works if they're just getting deals for individuals, but here's hoping they can stick around!